Even when Dr. Jase was young, he was a determined problem-solver. Set on getting a halfpipe in his backyard, he got his parents to say he could have one if he could show them what it would look like, with the hope that this would dissuade him. A few days later, Dr. Jase built a small replica of a halfpipe out of toothpicks and glue. Leaving behind his model-sized replicas, and after a two-year mission in Mexico, Dr. Jase decided to bring his “Mr. Fix-it” personality to oral health by attending the dental school at the University of North Carolina at Chapel Hill. 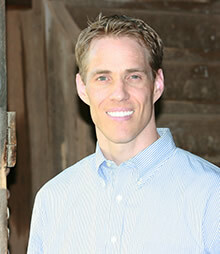 Not long after graduating with honors, he realized he loved the transformation he saw in orthodontics. Dr. Jase was awarded a slot in the University of Michigan’s advanced specialty education program in orthodontics and graduated in 2010 to become a board-certified orthodontist. That same year, he helped open Olsen Orthodontics with his lifelong best friend and brother, Justin. With family at the core of their values, there is no other way they would have it. He is a member of the American Association of Orthodontists, Southern Association of Orthodontists, American Board of Orthodontics, and American Dental Association. When Dr. Jase isn’t working, he is at home enjoying the “best thing” he has — his family — or being outdoors hunting, hiking, or enjoying nature.